Is the Razer Atrox for Xbox One compatible with a PC running Microsoft Windows? The Razer Atrox for Xbox One can currently be used on Windows PCs with limited functionality. You’ll need to use the current Microsoft beta drivers for Xbox One controllers. However, at this time, Microsoft does not plan to have official drivers for Arcade Sticks and thus, Razer does not officially support the Atrox for Xbox One on Windows. What components are included with the Razer Atrox for Xbox One in the retail packaging? The Razer Atrox for Xbox One is accompanied by the product guide, alternate bat top joystick, 13ft (4m) detachable USB cable and a screwdriver for modding. 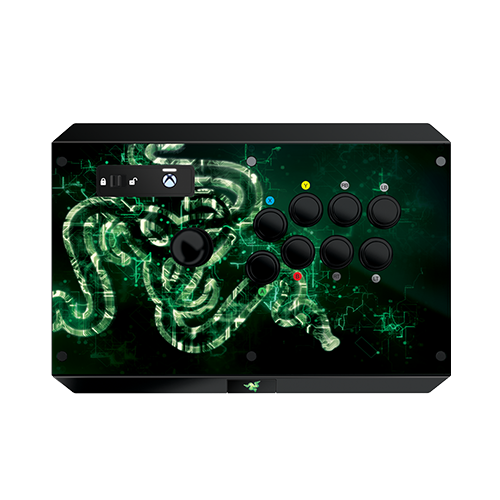 Are there any guides available for modding the Razer Atrox for Xbox One? Will the Razer Atrox for Xbox One work with a PS3 or other consoles? Nope, the Razer Atrox for Xbox One is only supported for the Xbox One. Is the Razer Atrox for Xbox One compatible with Razer Synapse? Can multiple Razer Atrox for Xbox One controllers by connected to my Xbox® at the same time? I have lost and/or damaged the cable that came with the Razer Atrox for Xbox One. How do I go about finding a replacement? Will the Razer Atrox for Xbox One work normally on an Xbox One® if plugged directly into a USB hub? Where can I find the serial number for the Razer Atrox for Xbox One? You can find the serial number in the inside compartment of the Razer Atrox for Xbox One. Press the compartment button to access the inside of the Razer Atrox for Xbox One. A sticker on the top right-hand corner of the hood panel shows the model number and the serial number of your device. The Razer Atrox for Xbox One top panel is secured by 6 screws, accesible on the underside of the top panel. Removing these will release the artwork sheet and the plastic layer, allowing you to replace it. What does the Lock Switch do on the Razer Atrox for Xbox One? Setting this switch to "Lock" will disable the Start, Back and Xbox Guide buttons.